← What’s Up with the Pantone Color of the Year — Marsala? 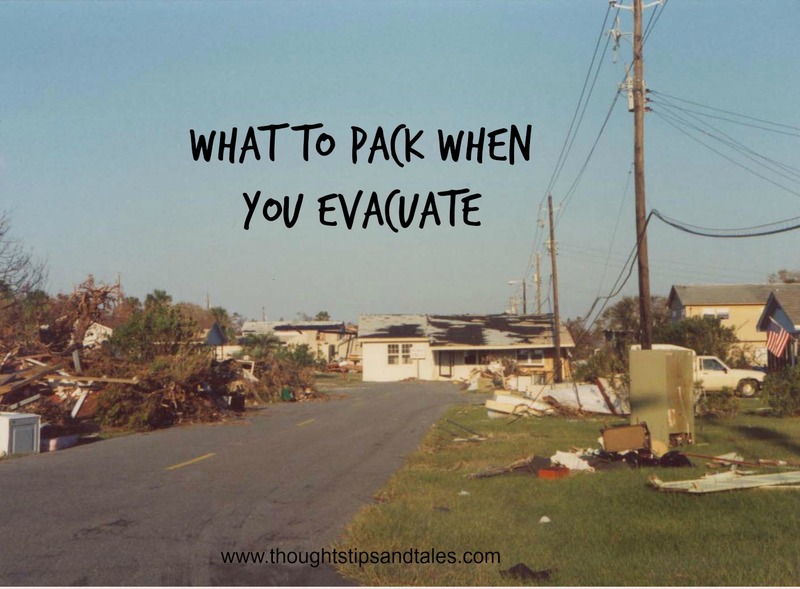 As someone who lost everything in Hurricane Hugo in 1989, here’s what I learned (the hard way) about what to pack when you evacuate. 2) Photos, photo files, photo albums, mementos, videotapes, etc. — that capture important milestones and memories. Storing photo files “in the cloud” or at a location outside your house right now is a good first step to saving what really matters in an emergency. I pay a mere $5 a month to have all my computer files duplicated and stored via Backblaze — and many other companies provide the same service. If you’re like me, you probably have CDs with photo files on them, as well as printed photos and “old school” photo albums or scrapbooks. If those items aren’t scanned and backed up outside your home, those — plus videotapes and priceless mementos (the Family Bible, etc.) — are the important things to take with you if you have to evacuate. 3) Homeowner or renter’s insurance policies and other important legal documents and bank account information that you might need to get aid after the event. Make a list now of paperwork that would be hard — or impossible — and time-consuming to replace. 4) Each child’s favorite toy or stuffed animal. 6) Your favorite item of clothing or most treasured memento. #6 is on the list because I still – 25 years later — regret not packing this! At the time we evacuated, I had a blue denim jumper that I wore often and loved. It was casual and cute – and fit my life as a stay-at-home mom. But in my resolve to be practical and focus on packing things for my toddler, I took only a few sets of shorts and tops and nothing “frivolous” for myself (including makeup). When we finally got to come back to what was left of the house six weeks after the hurricane, I was limited to packing remaining belongings in a single Hefty bag (since we had to travel to the island by communal boat, and that was the rule). Had my jumper not blow or washed away(! ), I wouldn’t have put wet clothes on top of the insurance policies and other paperwork I took from the file cabinet then, anyway. How I yearned to put on that familiar, comfortable “mom” outfit for years after the hurricane! Just like you’d pack a few items to bring relief to your child, you should also pack something to give yourself comfort, too. Make an evacuation packing list today and keep it someplace handy for quick reference. And I hope you never have to use it! This entry was posted in disaster preparedness, evacuation, packing to evacuate, what to pack when you evacuate and tagged disaster preparedness, evacuation, packing to evacuate, what to pack when you evacuate. Bookmark the permalink. Excellent post and great tips. I have thought about this when our home was threatened by a forest fire. Thankfully we did not have to evacuate, but it’s amazing that we don’t think of these things sooner. What a good exercise to think of these things ahead of time. Going to share this article with my readers over on my Facebook page (The Simplified Life) tomorrow. Thanks Again! Have a go to bag with everything or almost everything in it. Then when you have to leave add what you have to take and off you go. Add some food and favorite snacks that wouldn’t easily get broken you will be glad you did..Also pet food if you have pets. This can be added ahead of time .Add black garbage bags, gloves and mask. Do this ahead of time and every few months check it and replace things. Every member of the household gets a backpack so you will be able to bring a lot of stuff. Don’t buy the cutie flowered backpack get a sport backpack. They carry a lot even the little ones get a backpack but they get a cutie big enough for a few toys, snacks and a few outfits. Outfits should be appropriate for weather. Also everyone including the little ones get their own flashlights. These bags should be by the front door.